While apartment exhibitions and music salons are as old as art itself, urbanites from Berlin to New York are taking it upon themselves to reignite this ancient tradition. And Brussels is no exception. From folk gigs to performance art, citizens are opening the doors of their own homes to offer cultural experiences of a different kind. The most established and best-known initiative is probably Sofar Sounds, a hugely popular movement founded in London and active in 382 cities around the world, including Brussels. Music fans sign up via email and receive information about the private location on the day of the performance. 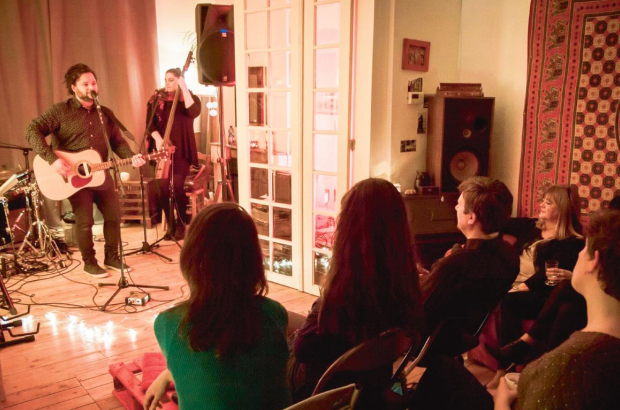 The cosy gigs in random living rooms across the city have become so sought-after that entrance can’t always be guaranteed. A lot of local initiatives are popping up all over the city, from Glaïeuls Paradise, which organises concerts in a variety of private locations with a focus on Belgian artists, to Musiques de Cour, a summer concert series in a private garden. “First I was a little worried because people need to pass through my living space, but everything always went smoothly,” says Barbara Decloux, who started Musiques de Cour in May last year and has already fully booked the programme for 2018: a mix of local musicians and others who are passing through Brussels on their official tour. In terms of genre, concerts tend to be folky, mainly for practical reasons. “I want to be respectful to our neighbours, so I make sure that I mainly invite one-person-projects; nothing too violent,” Decloux says. Accordingly, she has never had any complaints, and neighbours even gather at their windows and on their balconies to enjoy the gigs, too. This willingness to invest personal space and time to create chances for artists is also what has kept Tania Nasielski going. She’s been hosting high-quality exhibitions in her living room for 10 years, and has no intention of stopping. 105 Besme has grown into an integral part of the city’s art scene, even collaborating with contemporary arts centre Wiels to organise artist talks. Ans Mertens, part of Soil Collective, a group of art graduates who host exhibitions in their shared living room as well as a private garden, feels the same way. “The setting is much friendlier and welcoming,” she says. French artist Camille Lancelin, who has just started organising performance evenings in her spacious loft, agrees: “There is a real connection and dialogue between artists and public.” Right from the start, she was able to attract quite a crowd, and word has spread fast. Photo 1: Glaïeuls Paradise/Delphine Seminckx. Great idea but watch out for the Belgian taxman.....!